I posted last year about my dust collector closet. I still don't have doors on it; however, I have run two 4" PVC pipes. One to my table saw and one to the ceiling in front of my table saw. That'll let me drop a hose to my mobile tools in the front half of my shop. Last week while I was in the shop working on some small projects - more on that later - I noticed my dust collector bags were full and needed to be emptied. This is a messy job especially for a home workshop. I figured I'd show what I do to keep as much of the dust contained as I can. After all, what's the use of collecting all that dust if I just throw it back into my house whenever I empty the bags. 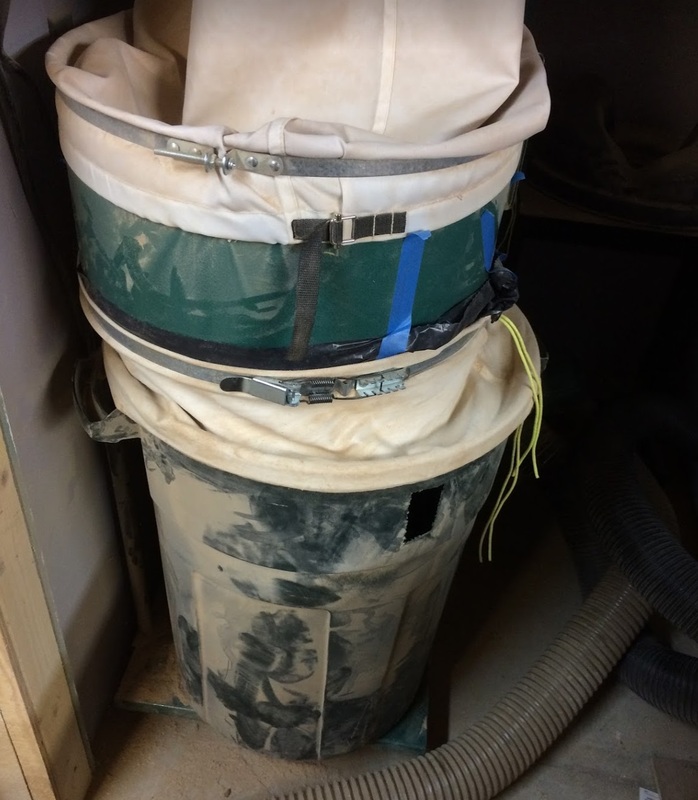 My dust collector is a 3 HP dual bag Grizzly. It came with canvas bags for both the top and bottom. 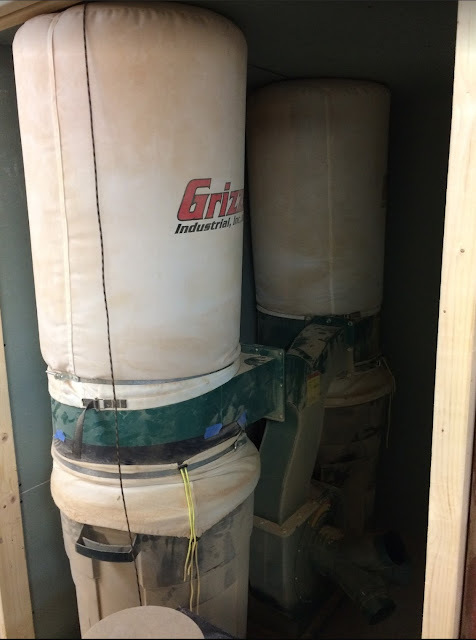 Adding the dust collector was a huge improvement over just spraying dust around my shop; however, the first couple of times I had to empty the bags it made a huge mess. The top filter bags get caked with super fine dust that knocks free whenever the collector is disturbed. I quickly learned to beat them before removing the bottom bags because otherwise I'd just dump it all over the place trying to get the bottom bag off and back on again. The next problem was emptying the bottom bag. Each bag held about 30 gallons of dust which was convenient. I could just empty them into a lined garbage can but huge plumes of dust would kick up. I suppose I could have put the collector bag into the garbage can, carried it all outside then emptied the bag but that would have risked spilling the dust in the living area of my house. My solution was to replace the bottom canvas bags with garbage bags. 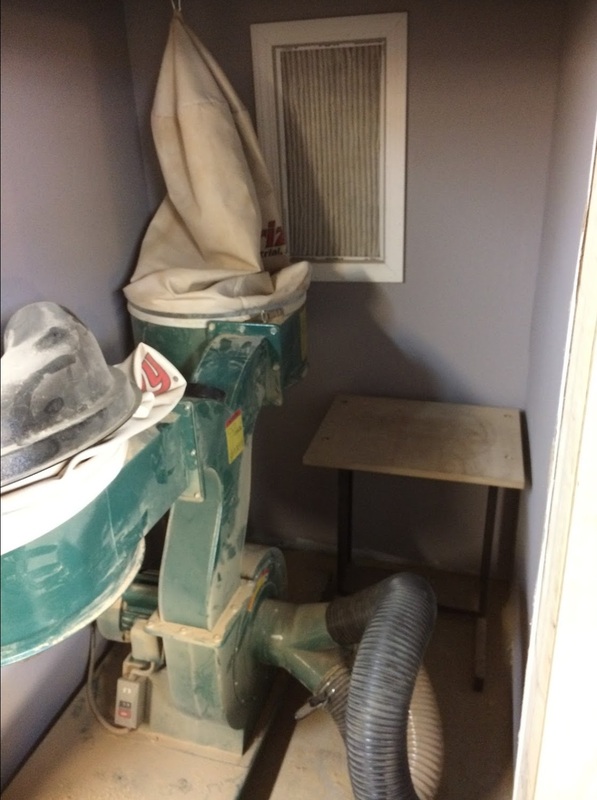 This way the dust was bagged at the same time as I collected it. 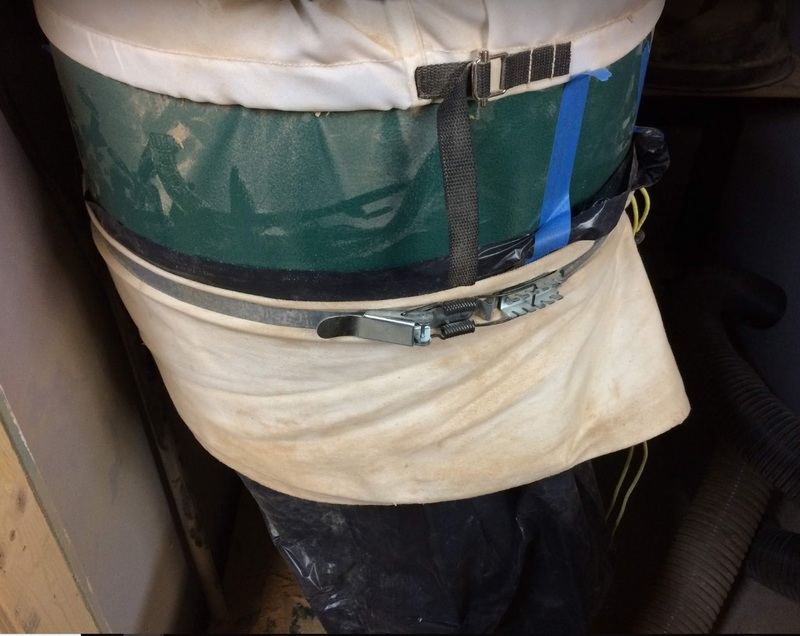 This was close to 20 years ago that I did this so I don't remember all the experiments; however, I do remember that just having the plastic bag attached to the collector was pretty noisy. 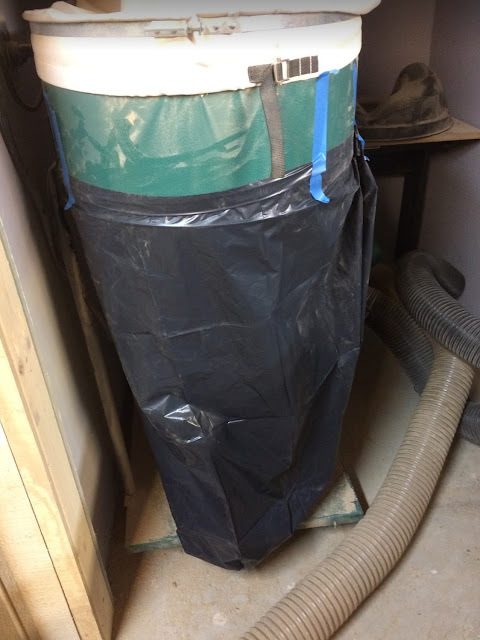 That was partially solved by putting the garbage bag into a garbage can and the last of the noise was handled by adding a canvas skirt to keep the flapping noise to a minimum. 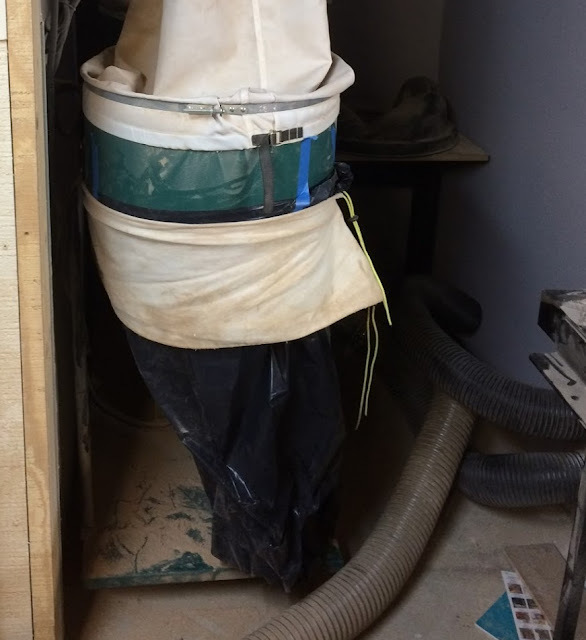 It probably decreases the empty suction to be comparable to when it's full; however, my shop is not that large and honestly the collector is probably over-sized. This means I have extra margin to spare. Regardless I haven't had any complaints. You'll note in step 2 I use painters tape to hold the bag in place. Yes, that's a lot of tape but it isn't very sticky tape and there's a lot of dust that decreases the adhesion. The tape will stay in place until the next time I empty the collector. The skirt shown above in steps 3 through 5 was sewn by my wife. It has drawstrings to help hold it in place while doing the bag changes but it fits tight enough they aren't really needed. In the last step you'll see I cut a hole in the side of the garbage can. This allows me to reach through and monitor the level of dust in the bag.